Onizuka Middle School is a co-ed school in Academy City's 13th district. It is, for the most part, unremarkable when it is compared to the other schools of Academy City, except for having a higher-then-average number of esper students and showing some excellence in athletic competition against other schools. Despite this, it is one of the few middle schools in it's district so it has a larger student body then an average middle school. The opinion on Onizuka students is, so far, one of ignorance. They haven't had any significant students or successes lately to bring the school some fame, so not many people know about Onizuka outside of the people in that district. Entry requirements into Onizuka are neither stringent or particularly lax, instead falling into a comfortable middle ground between the two. Usually it caters to around 500 students, depending on the time of year since Onizuka has a robust transfer student program. It's divided almost equally between male and female students as well as between esper and non-esper students. The majority of these do live near to the high school for ease of between home and there. Unlike the School Garden, there's also a larger abundance of entertainment to be found around Onizuka such as arcades and the like. This has helped to keep Onizuka's students remain relaxed and unstressed. 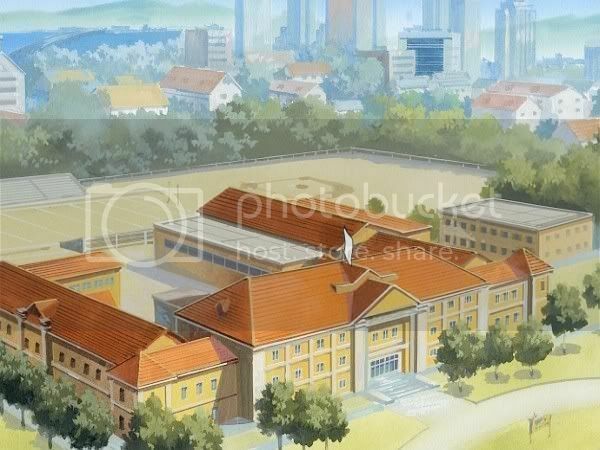 Onizuka is located in Academy City's district 13 consisting primarily of kindergartens and primary schools, which makes Onizuka Middle School a bit peculiar in that regard. The school is only medium sized and consists of one large building, it also holds a track and field area as well as a large swimming pool. These athletic facilities are the pride and joy of Onizuka and although they also use these facilities to help in psychic advancement, they frown upon anyone who unduly damages these facilities…before giving them a hefty fine that will cover the damages and then some. Onizuka has no dorms, attached or otherwise, but the administration for the school was able to work out a deal with the landlords of several nearby apartment complexes. Onizuka recommends these apartments to it's students (the same ones some teachers live at too, for added security) and in return the landlords give students a discount on their rent. Perhaps because of this, there are fewer Child Errors in district 13 then in other districts. In addition, close to the middle school and sharing the athletic facilities, is another school that also goes by the name of Onizuka. However this school is a high school, as opposed to the middle school, and the two share a name out of convenience and so they can share funding and such for the benefit of both schools. High school students and middle school students often inter-mingle during lunch breaks, rest periods (with how close the schools are to one another), or gym classes which have the same teachers for both schools.